Monday to Friday 8:15am - 5:30pm. 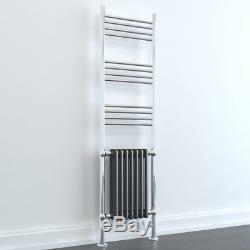 Traditional Victorian Colum Radiator Heated Bathroom Towel Rail Central Heating. First class products from a recognised and well-established UK business. We go the extra mile to maintain 100% customer feedback. Your order is always well packed and delivered on time. SolAire is an open and friendly business; if you have questions we are more than happy to talk with you. SolAire Heating Products Duke Traditional Victorian Radiator. Designer Traditional Column Victorian Radiator with Towel Rail. 2 Column, 7 Sections, Round Tube Ladder Towel Rail. Textured White Powder Coating - Textured Black Powder Coating - Bright Polished Chrome Plating. Brackets, Fixings, Bleed Valve & Blank Plugs. Four Point Easy-Fix Chrome Wall Mounting Brackets & Fixing Kit. Central Heating Period Column Radiators. 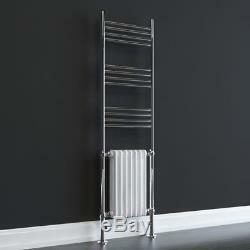 Unique traditional style bathroom radiator / hybrid towel rail for Central Heating Installations. 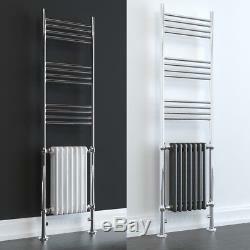 Chrome towel rail with column radiator in 2 finishes: Black or White. Wall projection = 110mm to the front face. The Duke Traditional Victorian Column Radiator And Chrome Towel Rail. The Duke Traditional towel rail with Column radiator, combines a contemporary Bathroom towel rail with classic Victorian styling. The addition of the elegant column Radiator gives this bathroom warmer a style of its own. The Column radiator is seamlessly combined with our bray towel rail, featuring our signature high-output, 25mm cross-bars, giving maximum heat output and styling. The Dukes' column sections are available in 2 classic finishes, white or black, each with 7 vertical columns. The chrome towel rail section is based on our most popular towel rail and features large sidebars and larger than usual 25mm cross-bar sections for maximum heat output. The Duke is a culmination of design and manufacturing excellence, tested to European standard BS EN442 and extreme salt spray ensuring the highest build quality you would expect for your bathroom, so we back the Duke with a 10-year guarantee. Matching traditional valves are available from our Accessories shop. This towel rail arrives empty and without connectors, suitable for plumbing into your central heating system. Valves or complete PTC and Thermostatic Dual Fuel Conversion Kits are available as separate items in our Accessories shop. To complete the Duke Range of bathroom radiators we can make them stand alone sealed electric heaters or offer a superb dual fuel heating kit for summer use. All SolAire Towel Warmers are tested to the highest standards (BS EN 442, ASTM B117). With thousands of satisfied customers you can trust the excellence in quality and service offered at all times. The item "Traditional Victorian Colum Radiator Heated Bathroom Towel Rail Central Heating" is in sale since Monday, October 02, 2017. This item is in the category "Home, Furniture & DIY\Bath\Towel Rails". The seller is "solaire_heating_products" and is located in Eppleby. This item can be shipped to United Kingdom.